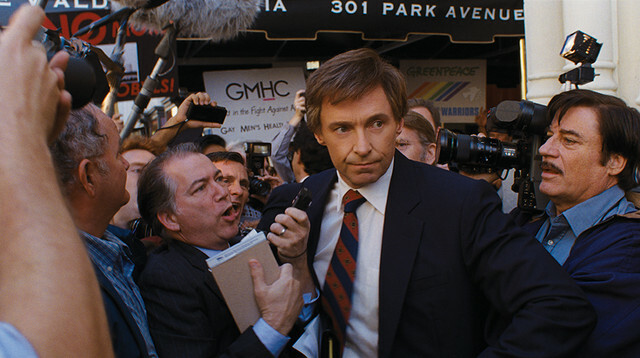 Jason Reitman's The Front Runner- a political real- life drama that takes us all on a trip to memory lane in the year 1984- following the life of presidential contender Gary Hart. With big potential, big cast members and a big saga to go on- will it do justice and stay at the front? Or will The Front Runner fall behind? Charisma, intelligence and dazzling hair- Hart would be one tough act to follow. However, The Greatest Showman’s Hugh Jackman managed to pull through bringing Hart’s personality to the big screen. The film begins in 1984, with US senator from Colorado, Gary Hart, facing defeat in the Democratic Presidential nomination. He sits in some hotel in San Francisco with his wife Lee (Vera Farmiga) and other colleagues/peers. We then fast forward to 1987 where they showcase Hart not only running for President, but being the front runner (hence the film title) thanks to his forward thinking, practical and progressive views, also not to forget his well-noted charm. Jackman’s portrayal of Hart may send mixed signals to some as it does seem to come across as filtered sugar-coated to the reality. Sources say that Jackman’s real life encounter with the real Gary Hart would mean that he would want to portray some truth the Hart’s character, but to also pay his respects to the man he met in real life. This can cause some inaccuracy and truth to Hart’s persona unfortunately, but Jackman’s own personable charm holds it through. The film shows the contrast of Hart as family man vs. his tainted image in the media which included his reckless behavior and infidelity with Donna Rice (Sarah Paxton). If there’s one thing that we can take from this film, it’s the vast progression in society’s press and media throughout the years. Back in Hart’s time, the media was flourishing into it’s very own being and so his flaws were the ideal topic for the press to feed upon. It was certainly a different time 30 years ago- where Hart’s actions wouldn’t have been heavily thumped on as it was in the past, as social media has introduced a new wave of new media and more problems for the press to feed on. The film comes loaded with precise historical details and are indeed quite informative to those who haven’t heard of Hart’s story before. Although the research can come across as offbeat and a bit muddled with it’s timeline, it is well-thought out and the various details of Hart’s story are what add weight to this film’s essence and truth. Bill Dixon, played by Simmons in the film stands out as the humorous lad and takes home the jokes cake- cracking up dry jokes in even the smallest hole of opportunity. It reminds you of the tightly written and witty screenplay despite the messy historical facts. Overall Reitman’s film definitely had potential, but it may have missed the mark a few times; falling behind a few spots from the front. I would still regard this as a worthy and watchable thriller that gives us all a glimpse into US politics that very much differs to the present time.